Newcomer in the local arena, Happy Mobile, announced the Oracle phone. This 5-incher packs an octa-core CPU in its 6.6-millimeter shell. Specifically, you’ll get an HD display on top of the 1.5GHz MediaTek MT6592 CPU which is coupled by the 1-gigabyte of RAM. 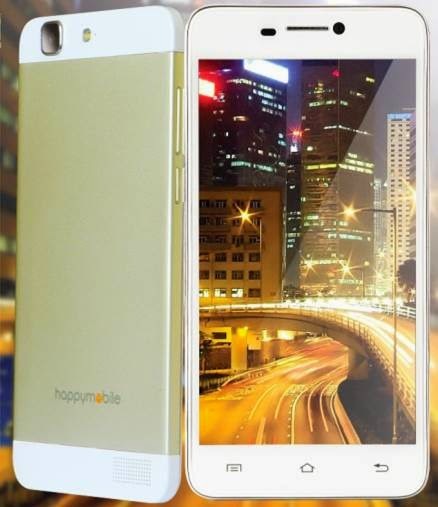 The Happy Mobile Oracle also boasts the 13MP/8MP camera duo, 3G connectivity, WiFi, Bluetooth and 2100mAh battery. One of its distinguishing features is the Miracast which enables wireless “screencasting” of audio and video to/from this handheld to other devices like smart TV or a tablet just as long as they are connected in the same WLAN. The USB-OTG allows you to connect your flashdrive to access some files or make the device as a powerbank for other devices. Design-wise, the Happy Mobile Oracle is highlighted by a premium aluminium side edging. The back case is painted in gold and silver. This smartphone will be retailed at Php 9,999. Check out the rest of the specs below.